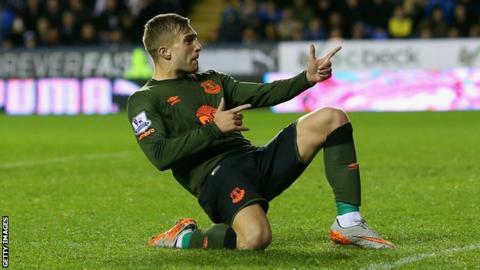 Everton survived a scare against Reading as they came from behind to win their League Cup third-round tie. Championship side Reading took a first-half lead through striker Nick Blackman as he finished a deep Ola John cross. Ross Barkley volleyed in a low left-foot shot to equalise after the break as the hosts failed to clear a corner. Gerard Deulofeu completed the comeback shortly after with a free-kick from 25 yards which Ali Al-Habsi could only parry onto the inside of the post. Reading manager Steve Clarke made eight changes to his starting line-up, but it was the Royals who had the better of the first-half chances as Blackman forced two smart saves out of Joel Robles in the Everton goal. Robles was again called in to action as Aaron Tshibola struck a fierce right-foot shot and centre-back Jake Cooper was just out of reach of finishing the resulting corner as he slid in at the back post. But Everton's escape was short-lived as Blackman bundled in at the far post for his seventh goal of the season to give Reading a deserved lead. The hosts continued to frustrate their Premier League opponents after the interval and John went close to doubling the lead as he flashed a shot just over the bar. But just as Everton looked to be rushing passes, up stepped Barkley with a fiercely struck volley for the equaliser as Al-Habsi was left with little chance to stop the England midfielder's left-foot effort. He perhaps should have done better to keep out Deulofeu's free-kick soon after as he palmed the ball in off the post. The Oman international did deny Romelu Lukaku the chance to extend Everton's lead as he raced off his line to block a one-on-one on the edge of the penalty area. Reading pressed for an equaliser, but speculative efforts from Chris Gunter and substitute Danny Williams were as close as they came. "I'm disappointed. I thought we played really well. First half especially, I thought we were terrific. "The performance was good. There were a lot of changes. That was my decision to make them, but I don't think they affected the rhythm of the team. They were as good defensively as they were in attack. "It's fantastic to have all the options available to me. It makes my job difficult which is what I ask the players to do." "I think Reading started really well and bright. When you get lots of changes you get into a little bit of the unknown. You're not sure how they'll gel as a team, but I think they did that extremely well. "I'm sure it was a little bit of the unknown for them as well, but I thought they started with a bright tempo, were very brave and played a high line defensively where we couldn't find the extra pass to open them up. "Gerard Deulofeu was tremendous with his work-rate tonight and we know what he can achieve. Then he comes up with that little bit of magic for the winning goal." Match ends, Reading 1, Everton 2. Second Half ends, Reading 1, Everton 2. Attempt missed. Danny Williams (Reading) right footed shot from outside the box is too high. Lucas Piazon (Reading) wins a free kick in the defensive half. Foul by Álex Fernández (Reading). Corner, Reading. Conceded by Ramiro Funes Mori. Corner, Reading. Conceded by Aaron Lennon. Attempt saved. Lucas Piazon (Reading) left footed shot from outside the box is saved in the bottom right corner. Substitution, Reading. Danny Williams replaces Ola John. Goal! Reading 1, Everton 2. Gerard Deulofeu (Everton) from a free kick with a right footed shot to the bottom left corner. Attempt missed. Nick Blackman (Reading) left footed shot from outside the box misses to the right. Corner, Everton. Conceded by Andrew Taylor. Chris Gunter (Reading) wins a free kick on the left wing. Substitution, Reading. Garath McCleary replaces Paolo Hurtado. Goal! Reading 1, Everton 1. Ross Barkley (Everton) left footed shot from the centre of the box to the bottom right corner following a corner. Lucas Piazon (Reading) is shown the yellow card for a bad foul.